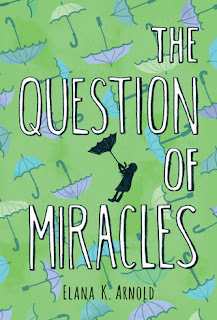 I have a huge pile of books to read, and to be honest, I chose The Question of Miracles because it was the shortest. Still, it took me far longer to read this book than others twice its length. It is sad and slow and I can't see it appealing to my students. Iris' family moved from California to rainy Corvallis after the death of her best friend, Sarah. Resistant to her new life, Iris doesn't want to enjoy anything about it, including her new friend Boris. 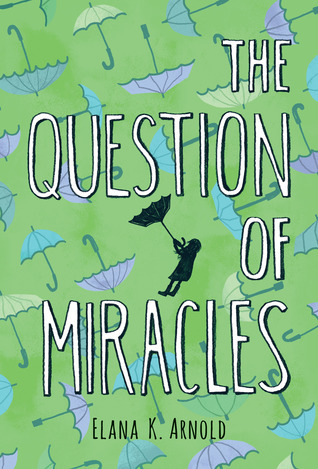 She wants to know why some people are granted miracles and some aren't. Really, that's it. There are some mild peaks in the book, but for the most part, I was irritated by Iris. She had wonderful parents who cared for her, but didn't appreciate it. Boris is the boy version of a golden retriever - kind, funny, smart, and eager. Iris spends most of the book thinking negatively about him. Losing a best friend is something no child should have to face, but I don't know if reading this book would help a reader in that situation. I won't be passing this one on.